We purchased 3 Haba games for our 4 year old daughter this Christmas: This one, Animal Upon Animal, and Socken Zochen. Something that really makes this game stand apart from the others is that it leaves adults and kids on a pretty level playing field. Hands down, the best feature of this game is its accessibility to very young children, without the detriment of having to dumb down the play to allow them to win. My youngest – 23 months – can even join in on the fun. She does tend to ‘lose’ most times, being a bit more clumsy (sometimes intentionally) with the pieces, but since winning and losing are moot concepts at her age, she’s hardly heartbroken over this matter, and often delights in seeing the pieces collapse. Other times, a game where we include her can actually go on for a good bit, depending on her mood. 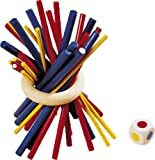 The game consists of the wooden ring, 27 6″ long sticks in vary widths: 9 large width blue sticks, 9 medium width red sticks, and 9 thin yellow sticks, and a die with two sides yellow, two sides blue, two sides red. The gameplay is simple. Grab all the sticks together, slide the wooden ring around the center of the bundle, give it a twist, and stand it up. This procedure is not easily manageable by a young child, and must be done by an adult. It’s also worth mentioning that the game must be played on a cloth or carpeted surface as the sticks are liable to slide on a slick surface like a table with as small a movement as the roll of the die. The game begins by rolling the die, pulling out the corresponding piece, and taking turns back and forth this way until the structure collapses. A caveat to this rule is if you roll a color that would surely topple the whole thing you can forfeit your turn, returning a piece of the same color and point value to the box. If all the pieces of the color you roll are already drawn, you may chose any color. At the end of the game, assuming you make it to the end, which is the point that 3 sticks are left standing and all others have been drawn, you tally the score for each player based on the worth of the sticks. Blue are 3, red are 2, and yellow are 1. This game reminds me of a combination of advanced pick-up sticks, and booby trap (or hens and chicks as some might know it) because of the multi-colored pieces and the corresponding difficulty in removing large pieces versus small. It’s a great concept. Easy to play, difficult to master. Because the balance of skill isn’t skewed toward the adult, I don’t feel I have to pace myself to give my daughter a fair chance. Because the integrity of the stack is reliant on all moves played, once it becomes unstable it’s anyone’s guess who will topple it. I bring the pile crashing down as often as the kids do. Which of course, makes this a great deal more fun to play than many preschool-aged games for mom and dad. All told, I think this is a fantastic little game. And, of course, I love that is made in Germany, not China. My sons are 3 and 4 and they love it. It is easy and fast. No reading needed, just color matching of the die and the sticks. Really fun. This will make great gifts! I bought this and several other games for a family member who suffered a stroke. Their right side was deeply affected. I found that this game was fun and highly effective occupational therapy. The whole family, 6 – 74 years old, played this in the hospital room. I can’t say enough good things about this simple game. It should be noted that this game wont work on a smooth surface. I keep a wash cloth in the box and play the game on it. Also, this game is too difficult for children under three.